Picture-perfect meadows, wild daisies in full bloom, swans swimming in waters that shimmered in the morning sun and reflected the ancient medieval ramparts of churches and cathedrals. It doesn't get much prettier than this in Europe! I was reminded of Salzburg, another lovely small city full of charm. 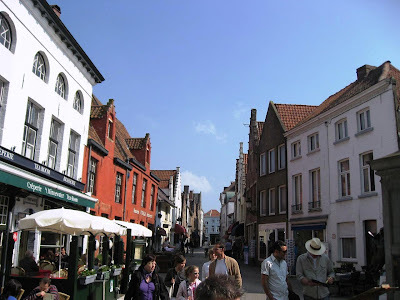 Bruges, also called Brugge in Dutch, has preserved its medival charm amazingly well. Time seems to have left untouched the ancient homes, churches and marketplaces. Its waterways and canals gives this city the moniker of 'Venice of the North' in Europe. During the time of the Vikings when this city originated, the canals were the primary means of trade and connected to the sea nearby. 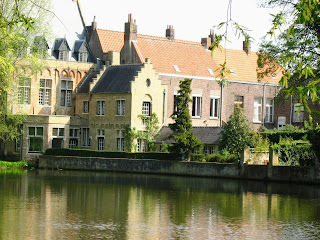 We had come to Bruges by bus from Paris. The comfortable double-decker afforded us an excellent view of the French countryside as we drove up the North of France, past Lille, and into Belgium. The railway track ran alongside and we saw the high-speed Thalys as well as the better known Eurostar trains whiz past. The North of France is mostly agricultural and was once also dominated by coal mining. While the mining industry has long since disappeared, fields of bright yellow mustard and sugarbeet lined the roads. The quick breakfast of delicious croissants, sweet breakfast breads and coffee was refreshing. 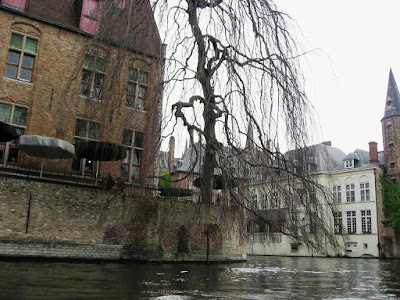 After we reached Bruges, we started off on a walking tour frequently stepping aside to avoid the horse-drawn carriages and bicycles. While in neighbouring France, you only see stone buildings, here everything is built with red bricks that have lasted several years. The Church of Our Lady with its tall spire in the city center is among the tallest brick bulidings in the world. Ducks and swans swam languidly ignoring the small boats filled with excited tourists. 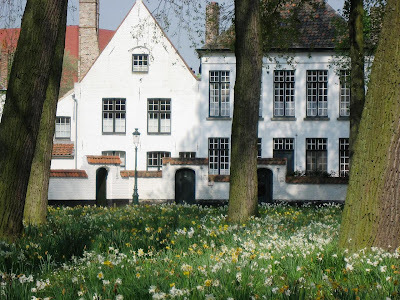 We strolled through the winding streets and narrow medieval lanes, through what was one of the world's oldest women's monasteries (the Beguinage) and around churches and cathedrals. Being a Sunday, there was also a flea-market along the canals; after some haggling we came away with some interesting old artifacts. 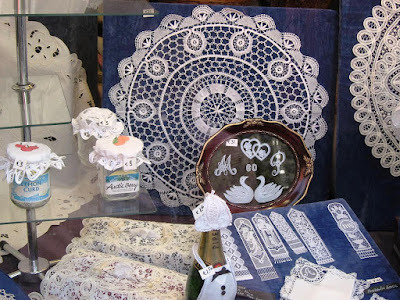 Bruges is famous for its chocolates and handmade lace. 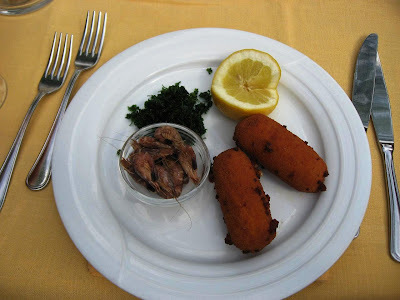 We peered into shops and sampled wares before we finally decided to stop for lunch. 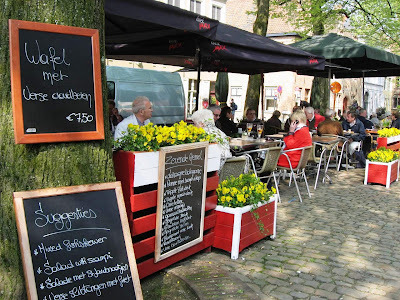 There are many pretty cafes and al-fresco restaurants along the canals and winding streets. We sat down enjoying the sunshine and resting our tired feet. 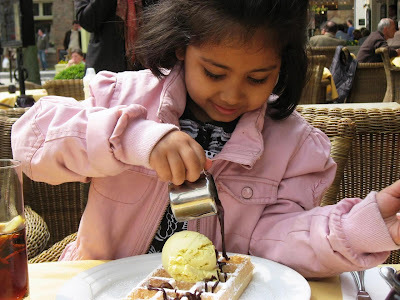 The girl immediately decided to try a Belgian waffle, while we ordered a beer as we perused the menu. 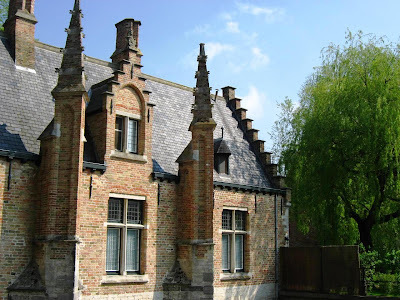 Bruges is home to 300 different varieties of beer. We loved the Bruges Blonde the waitress recommended. 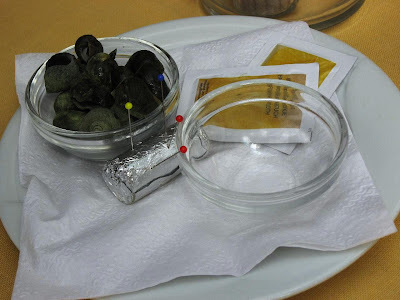 I nibbled on some snails (!) before wolfing down a most delicious Flemish Beef Stew cooked in local dark beer. My wife decided to try a prawn dish that wasn't particularly memorable. 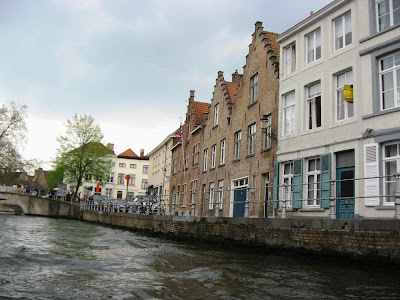 In the afternoon we took a boatride in the canals seeing the lovely city from another perspective as the flat-bottomed boats took us under low bridges and around town. 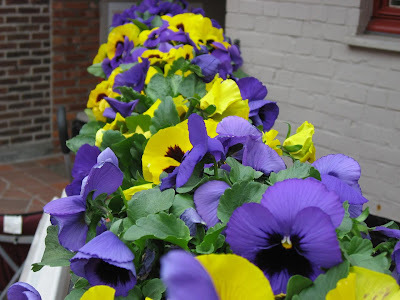 All through the trip, we could see bright flowers - pansies, daisies and tulips - in every porch and window-sill. Finally, our day came to an end. We were already weighed down by the many bags of chocolates, lace, and other miscelleny from the flea market we had been tempted to purchase. As the sun faded, we drove back into France. From Paris, we had used Cityrama for the tour; I would recommend them for day trips that originate from Paris. The buses begin their journey near the Tuileries metro stop and within walking distance of our 1st arrondisement aparment - an additional plus. 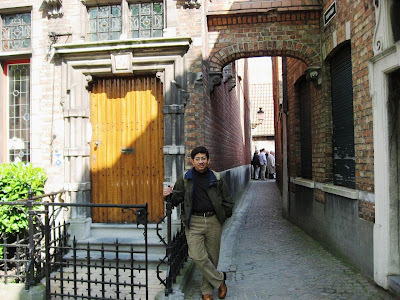 I was in Brugge more than 10 years ago, so thanks for taking me down the memory lane! Its a wonderful city with interesting European history and great architecture. 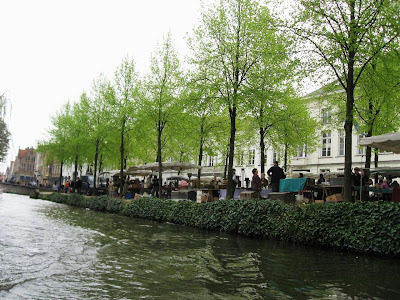 I remember a boat trip on the canal so well and it was a great and interesting visit. You've described it so well and documented it with great pictures - thanks for sharing! Btw: Since in Europe; any chance to see you in Norway? I am sooo jealous! We haven't taken a proper vacation in months!!! @RennyBA: Sadly, not in this trip. We are already back in Pune. But we do hope to come to the Nordic countries some time very soon. Postcard pics of Burgge! Can see you certainly had a good time. 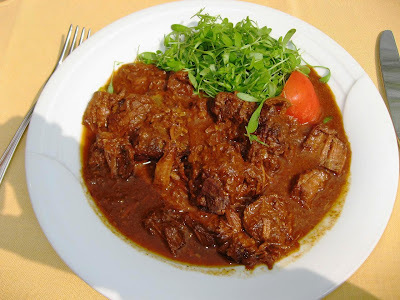 Flemish Beef Stew cooked in local dark beer sounds delectable. The snaps of lake and the medieval buildings are excellent. Nice post. Good to read your version of Bruges. I loved it when we went there last summer. Looks like your daughter is going after you. She looks quite the foodie...pouring chocolate on her waffle. I love Belgian waffles...yumm. 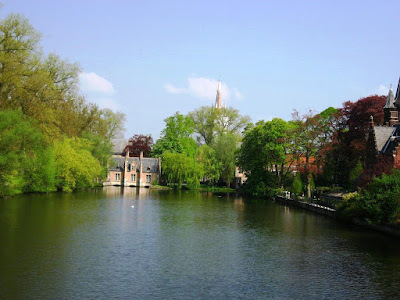 Here is my post on Bruges...my very first post on my blog. I think the mobile no. mentioned for Indus Kitchen is incorrect, could you please check it out. @indicaspecies: It was pretty good! @Vamsee: Will read your post. I am in the middle of some more travel right now, but within India! @harekrishnaji: Thanks for pointing this out. I will check. @Welcome here, Karthik. Thank you.